I was just a year old. My family moved from south Los Angeles to Saint Helena Island, just off the coast of South Carolina. We lived in the town of Frogmore, the location of legendary Penn Center. Saint Helena Island, midway between Charleston and Savannah, had once been a sanctuary for free blacks (Union territory during the Civil War), and the location of a school for the same. It remains an active cultural heritage center to this day. In the 1960s, Penn Center was a conference center for some of the leaders of Black America. My parents even joined in a meeting attended by Martin Luther King Jr., Jesse Jackson, and—I daresay—even Joan Baez. The lower coast of South Carolina was the focus of much Bahá’í campaigning in the late 1960s. My family played a part in those campaigns. This deeply southern portion of the state is generally poor and black, two qualifications that made the area a prime target of proselytizing. But presently, 45 years later, there is little sign of that burst of campaigning. According to the Association of Religion Data Archives, the population of Bahá’ís south of Lake Marion is quite low. 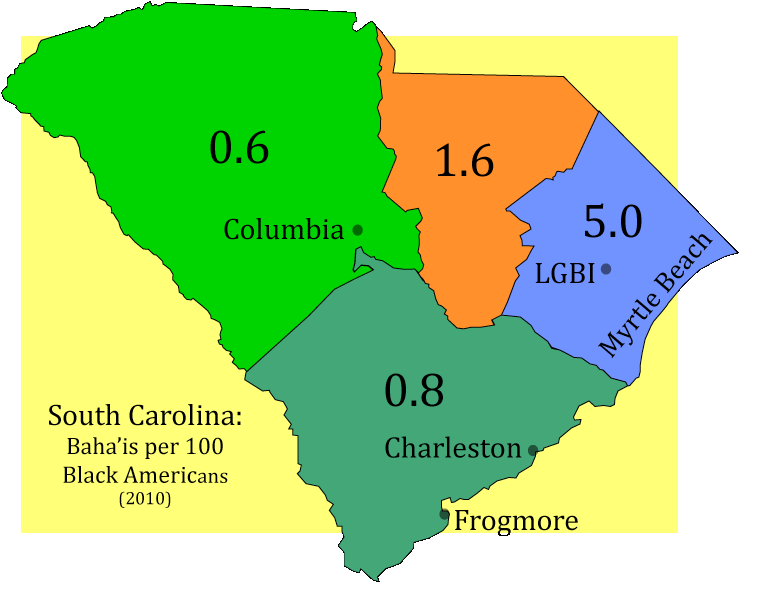 Only in Colleton County, just northeast of Beaufort and Frogmore, do Bahá’ís constitute more than 0.7% of the population. On average, the poor, black counties that stretch from the Savannah River to Lake Marion are 0.6% Bahá’í. The penetration of the Bahá’í Faith is significantly greater in the somewhat less black counties north of the Santee River. From the Santee north to Dillon and Darlington Counties, Bahá’ís constitute 2.4% of the population, four times the density south of Lake Marion. This region has a greater concentration of Bahá’ís than anywhere in the United States. This is probably because the Bahá’ís have an “institute” (LGBI) and a radio station (WLGI) at Hemmingway, in the heart of the area, where Williamsburg, Florence, Marion, and Georgetown Counties meet—just inland from the resort complex along Myrtle Beach. South Carolina, as a whole, has a much lower density of Bahá’ís. The only area in the United States that comes close to the Myrtle Beach area is the Pine Ridge–Rosebud area of South Dakota, where Bahá’ís began a campaign to convert impoverished reservation Indians in the 1980s. The penetration of the Bahá’í Faith there is just under 2%. The Standing Rock Reservation on the border of the Dakotas has a Bahá’í density of just over 1%. The highest density of Bahá’ís in the United States outside of South Carolina and South Dakota can be found in the vicinity of Bosch Bahá’í Institute, on the central coast of California. Over 2,100 Bahá’ís live between Bosch, Salinas, and Monterey (a density of about 0.33%). This is not very impressive, but it’s higher than the same stat for southern South Carolina (0.29%), where once the Bahá’ís made great strides toward their dream of “entry by troops.” Unfortunately for that dream, that great moment of sea change that brought the movers and shakers to Frogmore is long gone, and little sign of the Bahá’í religion remains south of the Santee. A Bahá’í community can be found in listings for the city of Charleston, but elsewhere in the region, you’ll need a Bahá’í membership listing to find a Bahá’í. There are over three times as many Mormons in the area, and don’t look now, but the Muslims are closing in. Louis G. Gregory Bahá’í Museum, Charleston. Entry by appointment only. Site last updated in 2003. This entry was posted in Dixie, Personal and tagged growth, Islám.